by Brianna Crandall — April 23, 2018 — Technology-enabled services provider BuildingIQ just announced that it has launched a mobile app designed to provide a building’s facilities management (FM) team with access to BuildingIQ’s 5i Platform while on-the-go. 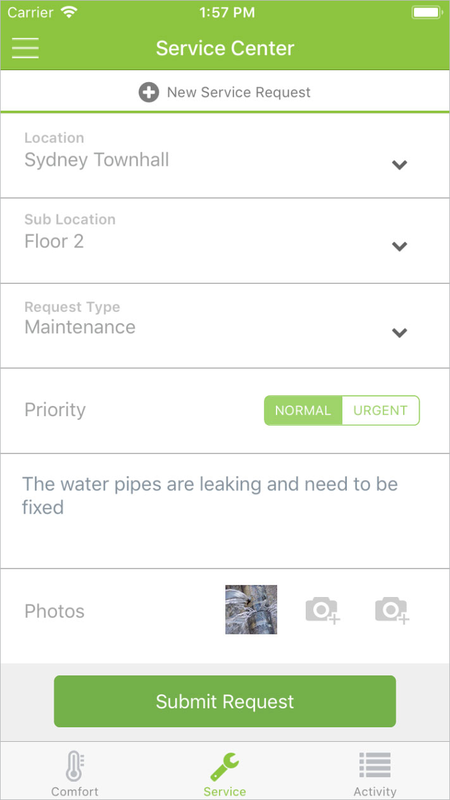 With the maintenance app, members of the facilities team can identify and submit issues within a facility or campus, document with mobile photos, and automatically create a maintenance ticket in the moment. Features can also be enabled to allow tenants to submit service requests for automatic ticket creation. The app may also be used to engage tenants on how they feel about the space by enabling a Comfort module. With Comfort enabled, it takes only a few seconds for a building occupant to let the facilities team know if a location is too warm, cold, or just right. This vital feedback is mapped to building system status and presented through heat maps depicting the human factor of cooling and heating operations. The BuildingIQ Mobile App is now available for current BuildingIQ customers utilizing Facility Worksite. Mobile applications can be great for productivity when done right. Apps that combine both facilities professional and tenant tools in one — like BuildingIQ’s app — are potentially very valuable in delivering flexibility, utility and engagement. This is especially true as building owners, management firms and facility companies all embrace broader service offerings. This intuitive app integrates with our intelligent energy management platform, allowing the user to document, assign, track and verify tasks in real-time. The tenant-facing features are a key step in allowing people working within a building or campus to act as an extension of a building’s sensors and fault detection system, so that issues can be identified and resolved quicker. Using the Service Center module, each member of the FM team can create and manage work ticket that they created or have been assigned to them — all in the moment — to improve efficiency. The Service Center module provides an overview of all work orders so that managers can ensure operations are running smoothly in real-time. By enabling the Comfort module of the BuildingIQ Mobile App, facilities teams will be able to gauge the “human” impact of their heating and cooling strategies, by turning tenants into the ultimate building sensors. Everything is made simpler by using the Goldilocks principle – a tenant is either “too cold,” “too hot,” or “just right” at any time during the day. When submitting comfort information, feedback will be tagged by location within a building by floor and, more specifically, by the space/zone on that floor. The data can then be used to create heat maps to correlate hot and cold comfort calls with building system settings. This will encourage more real-time feedback, replacing hot and cold calls that occur only once discomfort has escalated to a point of disruption. The BuildingIQ Mobile App is designed to be used by current customers. A Facility Worksite subscription is the minimum recommended requirement to benefit from using this service app. The BuildingIQ Mobile App is available for download at the Apple App Store or Google Play. Learn more on the BuildingIQ website. How do you track maintenance activity? See what other managers do and how CMMS software can help March 1, 2019 In "Surveys and Trends"
Find out how this new IoT solution allows technicians to monitor and diagnose building equipment remotely and avoid breakdowns July 13, 2018 In "Products and Services » Software & Technology"
To simplify operations and maintenance and increase efficiency through your IWMS, check out what MCS and Axxerion are doing together January 23, 2019 In "Developments » Corporate and Organization"
View only the data you need, for improved efficiency, with this updated CMMS software-as-a-service March 15, 2019 In "Products and Services » Software & Technology"
Benchmarking maintenance best practices – Part 2 July 1, 2018 In "Benchmarking » FM BENCHMARKING"